Windows - North Star Windows & Doors | Find a Dealer! The Series 1000 window has a traditional look with a 3-1/4″ deep frame that is well suited for most applications. Energy efficient and durable, this window is available in a casement, awning, single-hung, double-hung, single-slider, double-slider and custom shape. 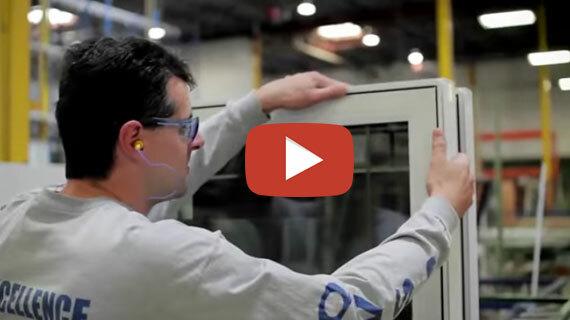 See how our windows are made! North Star’s high-performance windows and doors are designed to hold in those comfortable inside temperatures your family enjoys, keeping out the cold, wet and summer’s heat. And while you are enjoying your home, your new North Star windows and doors will help you to save money. To increase the efficiency of our windows and doors, North Star uses energy-saving Low-E glass that features a near-invisible coating that reduces the amount of heat lost while letting in maximum light. North Star High performance vinyl windows are on average twice as efficient as the average window made ten years ago and can help reduce your energy bills significantly. Use the sun’s natural heating and cooling abilities to go green and help your energy bills. North Star offers several unique glass coating types which help to keep your home warm in the winter and cooler in the summer. These special coatings reflect heat back to its source, whether the sun or your furnace. And they are near-invisible—letting in maximum light while saving the most energy. Whether you live on a quiet street or near a busy intersection, sometimes you want to keep the outdoors out and the indoors in. Our easy to close windows can help to block out unwanted noises—your neighbour’s boisterous backyard barbeque, too early in the morning construction or barking dogs. Whatever the disturbance, North Star’s well-crafted and streamlined windows can help to block it out. This is due to our Super Spacer® technology built-in to all of our windows and our fusion welding process, which adds strength and ensures a perfect seal. With North Star’s innovative E-Z Screen, cleaning your windows is a breeze. Featuring a completely hidden retention system, the E-Z screen has smooth edges that won’t snag on draperies and is incredibly easy to use. Simply push down on the screen and it will pull out with ease. Putting your screen back in is just as easy. Simply snug it back in and it will seamlessly and securely pop into place. You won’t need two hands to close your new North Star Windows. Our nesting folding handles allows for smooth and easy movement. North Star’s innovative low profile nesting folding handles tuck out of the way and give our variety of window styles a sleek, elegant look. Several hardware finishes are available for all hardware options. Make your house a home and a work of art. At North Star all of our windows are custom-built not only for the perfect fit but also to suit your style. We build windows in custom shapes, colors and grilles to enhance your home’s appearance—inside and out. To compliment your home’s unique style, there are seven exterior colors available. And for the interior trim, you can choose either standard white or enjoy the warmth of an oak finish, which comes in two tones.